Just a couple days after saying I wasn’t going to make 2014 Holidailies a post-for-post homage to 2013, I am returning to that idea because unfortunately the crud I thought I’d successfully fought off got the better of me starting late yesterday, so I need a quick win here as I sit in my bathrobe at home, cycling through fever and chills. 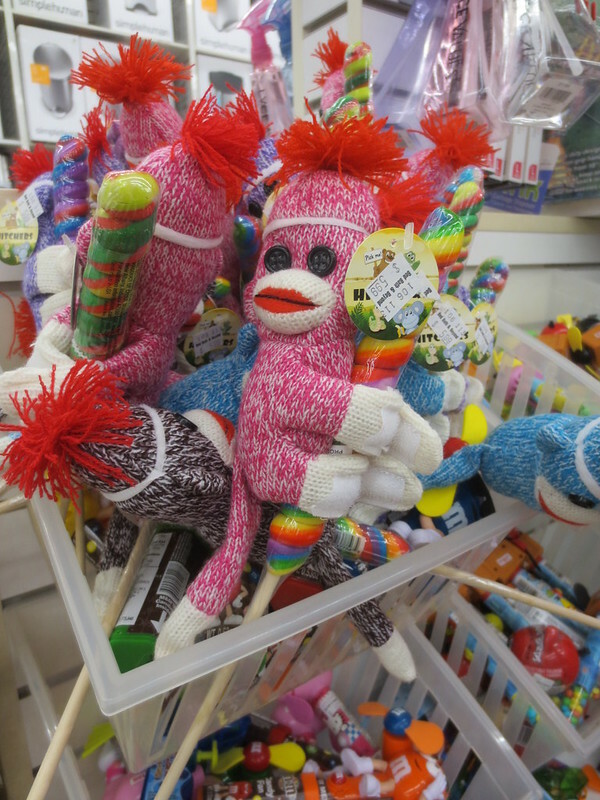 When I saw that my December 3rd entry last year was about not buying sock monkeys, I thought “hey, I haven’t bought a lot more monkeys since then, and have photos of most of them”. So join me if you will on a tour of some of the monkeys that did not join my collection (it has not grown since March of 2013). I saw this jaunty fellow at the combination drug, gift, housewares, and hardware store in Sandpoint, Idaho this past spring. 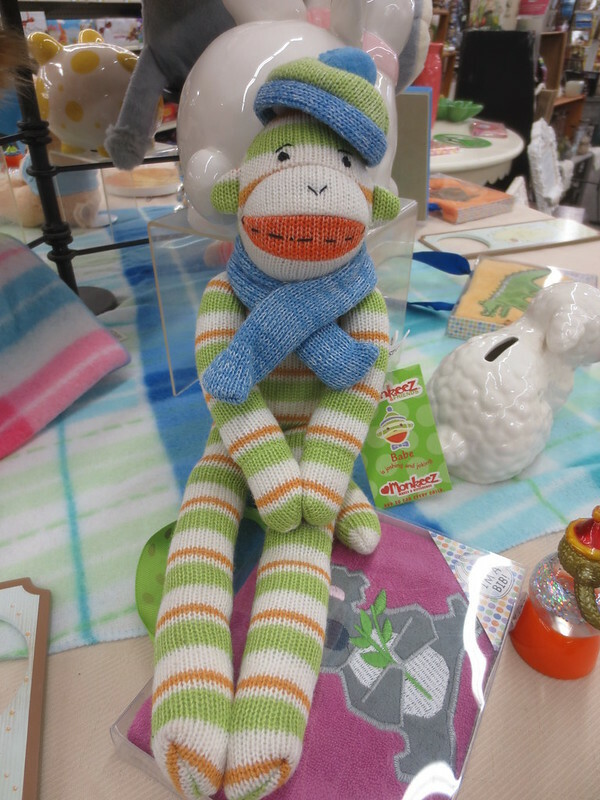 If he’d been smaller and more portable, I would have been more tempted to have him join my sock monkey family, all of which can be squished into one tote bag for travel if need be. These next monkeys with Velcro on their hands fit my size requirements, and would have provided diversity in that I don’t have any monkeys who have their heads turned to the side like this but I couldn’t see leaving it wrapped around that sucker for the long term, and if not the sucker, what—the other monkeys, distressing them with the threat of being stuck with Velcro? No thanks. 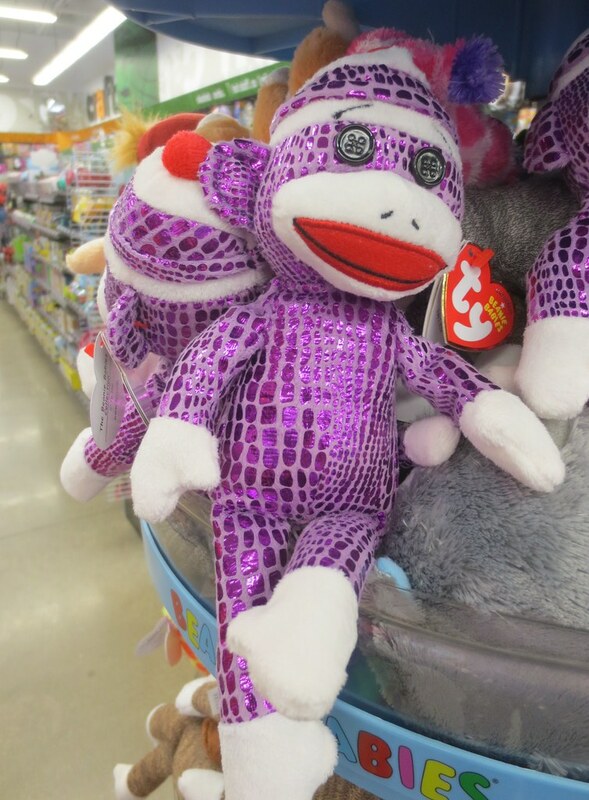 This shiny purple monkey was especially hard to resist because a) purple, b) shiny, and c) it would fit right in as I already own some of its brothers and sisters of the same style. 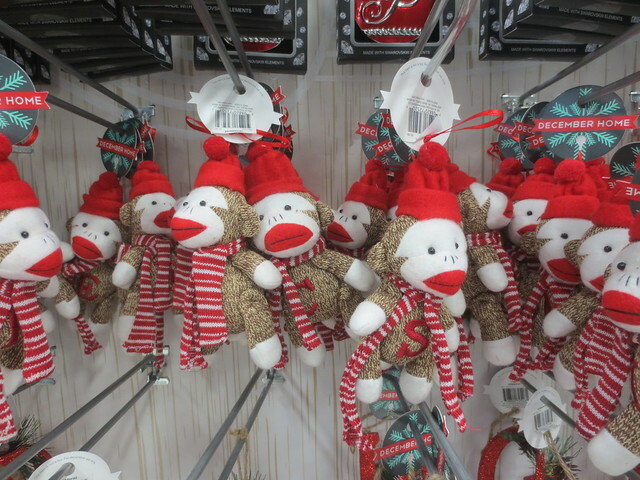 These last monkeys are still available, little monogrammed Christmas ornament monkeys with fleece hats and striped scarves. I am quite tempted to get one of these, but so far have been able to leave them in the store. If I wait long enough, the letters I want will sell out and the moment will have passed. Perhaps a small monkey would be a good reward to give myself if I keep up with my food logging, or if I lose weight this week or this fortnight. I could look at it and think “I can do this”. But I’m meant to be reducing my possessions for an eventual move from our house into our smaller condo, so perhaps not. I’ll decide later, when I’ve recovered from this early winter crud and am not so fuzzy headed.